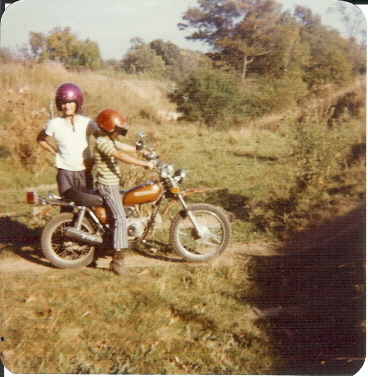 Our second bike, Honda XL70, fall of 1974. Look at those pants!!!! Which curtain did grandma make those from?!? Purple helmets and striped pants! I LOVE old pictures! Looks like that is across the road from your house if I remember correctly. We spent many days riding over the years growing up. Lots of good memories. Brian T.